The photos of the rooms are located in a new building addition to Harmony Christian Church located near Elwood, Indiana. Six classrooms were part of the addition and themes were chosen for three of the new classrooms. The first room was a deserted island Pirate room. We began by painting the upper portion of the room blue for the sky. The bottom portion of the room was already painted the tan color. The sand, palm trees, clouds and ocean were then airbrushed. Clings were printed at The Howard Print Shop and they include the treasure chests, parrots, compasses and telescopes and applied to the wall with shadows airbrushed behind the clings to “set” them in place. 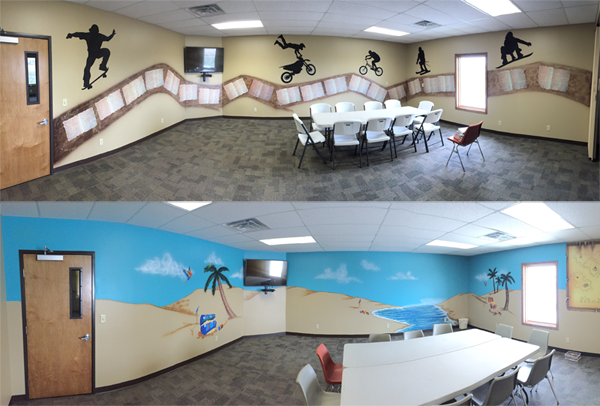 The second room was an “extreme sports” theme with scripture added. The church had a Bible copyrighted 1873 which was photographed and printed on parchment paper at The Howard Print Shop on the wide format printer. The edges of the paper were burned to give it a very old look. The walls were airbrushed in waves and a texture was painted to the waves before adding the printed scripture to the walls with Modge Podge. Five large clings of various sports figures were printed at The Howard Print Shop and applied above the waves on the wall. The third room was designed for toddlers. The walls were painted blue and bubbles and seaweed were airbrushed in various places about the room. Twenty different clings were printed at The Howard Print Shop of various ocean fish of different shapes, sizes and types and applied to the wall.